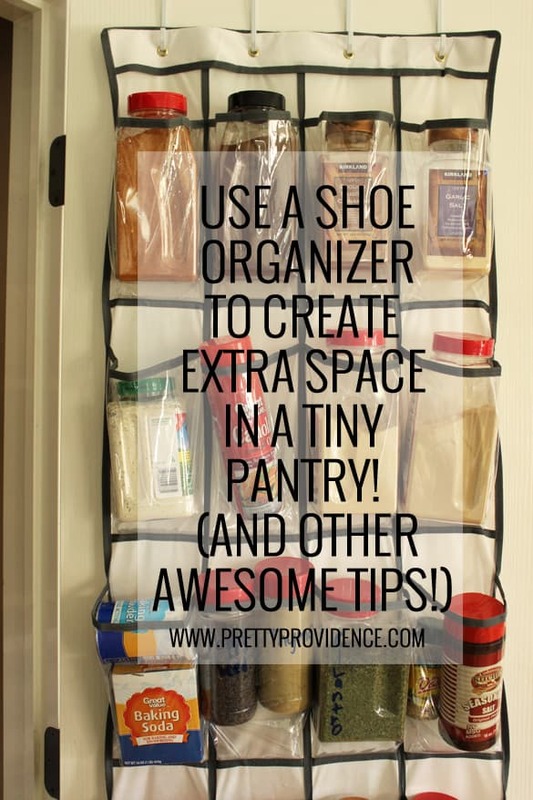 Awesome Small Pantry Organization Tips and Tricks! When you live in a home about my size you realize quick that it is lacking one thing… storage space! It didn’t take long after moving in for every closet, cupboard and drawer to begin to be overfull and overloaded. 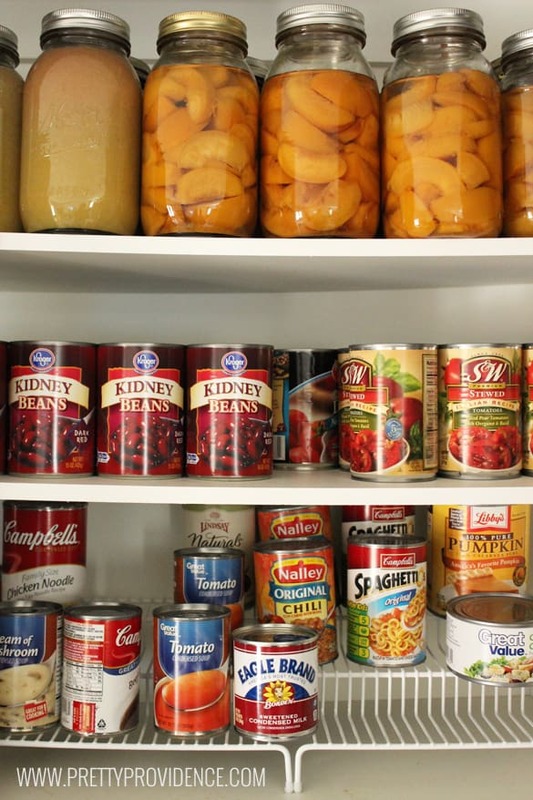 The worst area in our house was the pantry, because, we like to eat or something I guess! Anyway, de-junking is a crucial first step, but I knew organization solutions were going to be key in a space this small, otherwise it would just become a mess again and again. It has been months since this pantry was first organized and I am thrilled to report that it is still as neat, clean and functional as the day I did it! Can I get a woot, woot!? Special thanks to my MIL Colleen! I couldn’t have done it without her! So, without further ado, read on for all my small pantry organization tips and tricks (and an embarrassing before picture)! Could you believe that before picture? It honestly doesn’t even do it justice either! Okay, so although you can kind of see what I did in the picture let’s break it down a bit shall we? In a space as small as mine, I was looking for any and every possible way to maximize space! Did you know that tin foil, saran wrap etc. fit perfectly in a magazine holder? And even better, they are only a few dollars at your local Walmart, score! Before, I always had the peanut butter, syrups, etc. piled in the same corner, that somehow always became a sticky, oily mess. 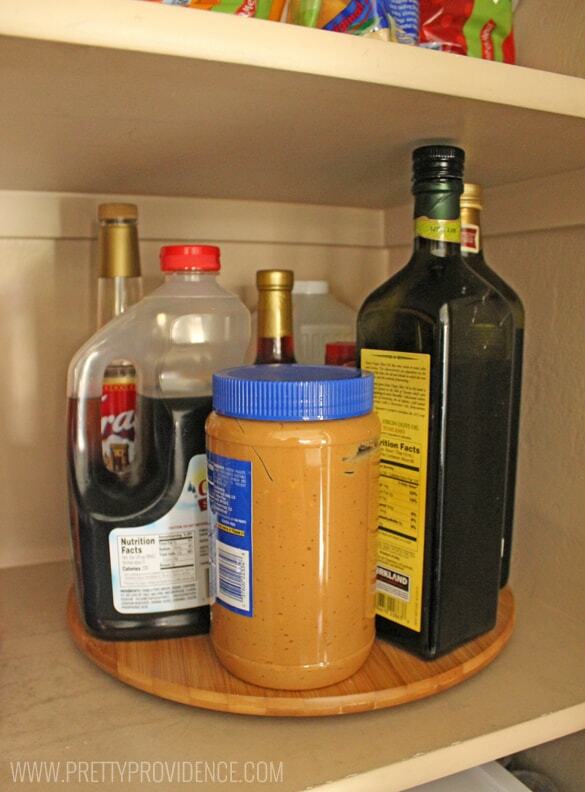 I had my doubts, but it turns out that the lazy susan was the perfect, easy solution! Everything still has its own “spot” you just rotate around to what you need.. easy, quick and clean! 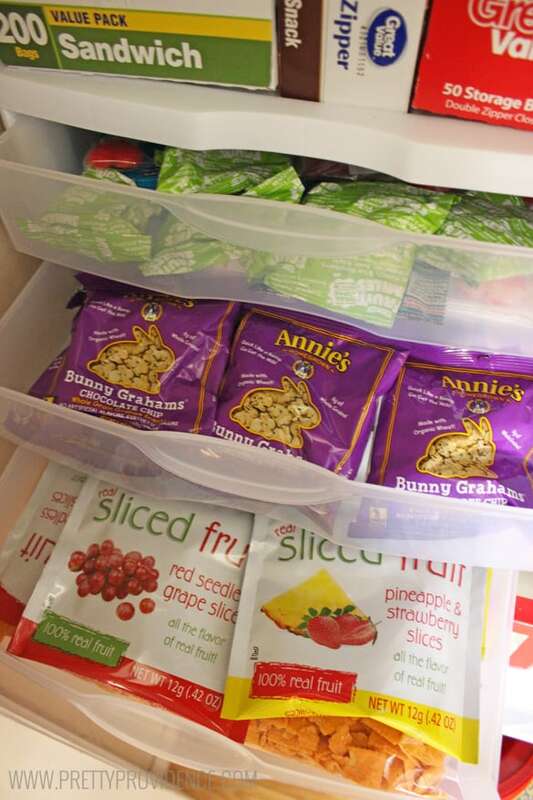 I used pull out bins for easy snack storage. Lots of things I buy pre-packaged for convenience, but the things that I don’t I just switch into snack sized zip lock baggies and then stick them in the appropriate drawers! Knowing which size/type of drawer to get was a little bit of trial and error. First things first I measured the height, width and depth of each shelf and wrote them all down. Then I took my measurements to the store with me and picked what I thought would best fit the things I wanted to fit in drawers. I bought extras if I was unsure and then just returned the ones I didn’t end up using. 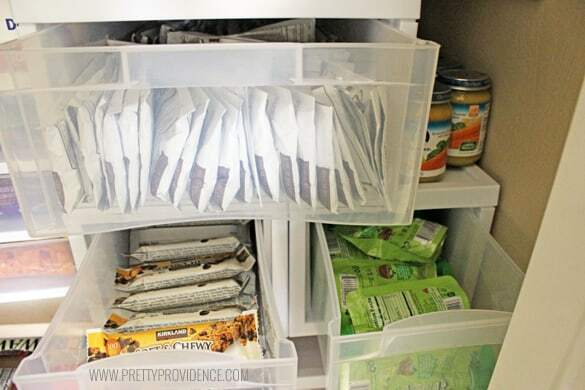 I picked specific bins for things we go through all the time, which right now for my kids just so happens to be applesauce, granola bars and breakfast drinks! Once I had my bins full and where I wanted them I assessed what items I had left to store and which spaces they would work the best in! 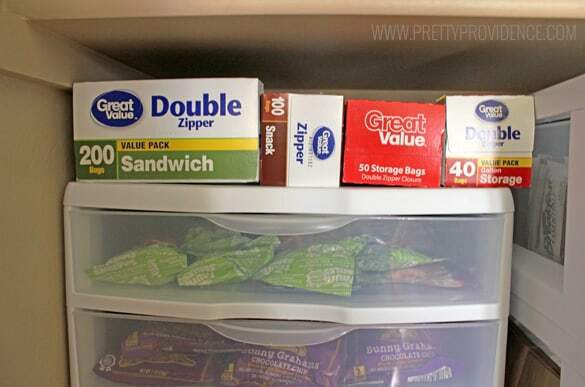 How perfect do my baggies fit right above the three stack shelf? Even just enough space to grab from the top! We can’t forget my very favorite addition! An over the door shoe rack to hold all your extra items! You could fill yours with cans or really anything, but I used mine to store all my most used spices, pam, straws, and a few other random things we use all the time! Love, love, love it. I use an extra cupboard in my kitchen to hold most of my cans, so here is what that looks like! I use the top for all the bulk cans that I have a bunch of and these tiered can holders for things that are more random so I can better visualize what I have! Well, there you have it folks! I hope that helped give you a bit of inspiration when it comes to making your small pantry as organized and functional as possible! P.S. If you liked this post you will probably love this post on how to de-squeak your doors, or how to save money on groceries! Yay! Thanks so much for the tip! I love this! 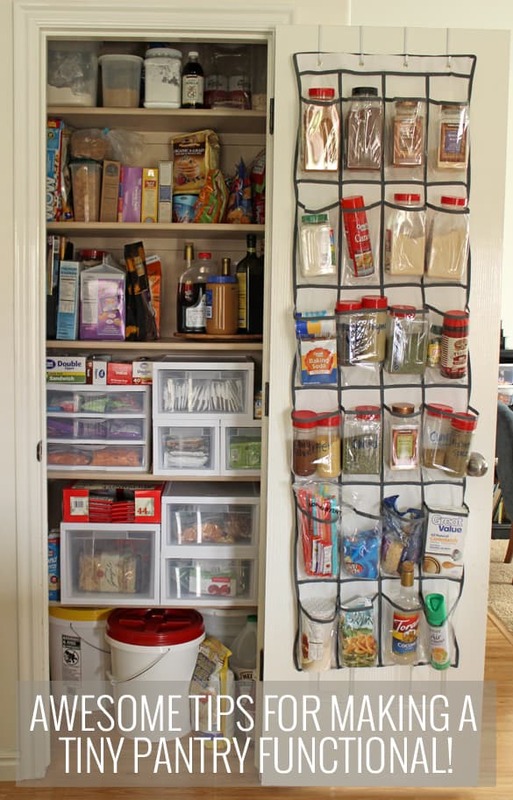 My pantry is always a disaster but there never seems to be enough time to organize it. Any tips for organizing really deep cabinets? I have lots of pantry space but most of it is so hard to get to once I pack it full of food. I think if you buy some strong plastic baskets, or cover Cardboard boxes with paper, then you fill each box with a CATEGORY of food for example, Italian in one, Mexican in another, soup, then you Can put one box behind another And only have to move one box to get to the oNe behind it.